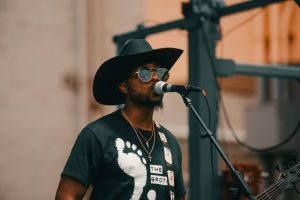 Adopt-An-Artist sponsorship is an impactful way for a small business or individual to support Mile of Music and, more specifically, support bringing in artists, both local and national, that have instilled in us a love for original, handcrafted music that most of us didn’t even know we had! This is a great opportunity to have a big impact for the smallest sponsorship amount of $500! Though Adopt-An-Artist funds do not underwrite all costs associated with the artists, your contribution assists Mile of Music by providing partial support of the artists’ fees, lodging and hospitality during the four-day festival. Pledge to sponsor an artist by providing us with your information here. You can pay directly with a credit card with this link. Interested in processing your payment in-person or via mail? Contact [email protected] for more information! We’ll notify you once you’ve been paired with a solo artist, duo or band. Your name(s) will be included with that artist, duo or band on the Adopt-An-Artist page on our website, as well as our signage placed at Festival Headquarters located in the lobby of the Fox Cities Performing Arts Center, the Red Lion Hotel Paper Valley, Houdini Plaza and our second main stage! Thank you for being an enthusiastic driver of Mile of Music! We absolutely would not be able to bring original artists to our community and make this festival happen without you!